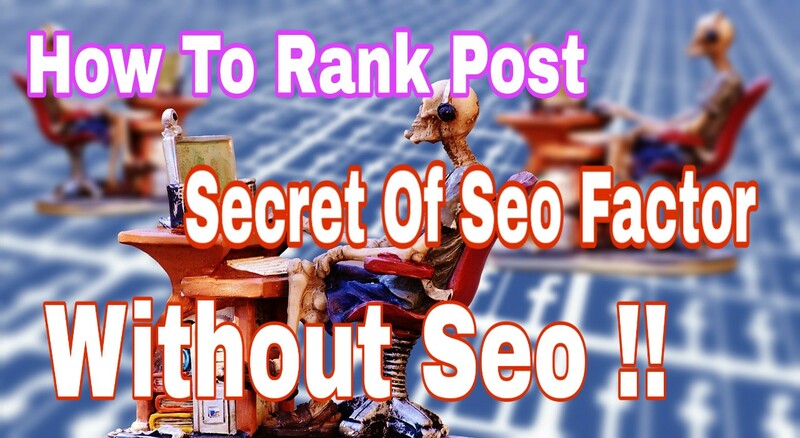 Hello friends In this post today I am going to tell you "how to rank without seo post top rank" because many people do not have any information about seo and bo wants to give top post to their post. How to get a post rank without seo ? If yes, if you want to post your blog without seo, then post big, if you can not seo your post then you can write a big post. Many bloggers write small short posts and want to get them top rank but I can tell you that the big post you write will be able to get your post as fast as possible and if you write short posts then come to the top 10 search results of your post. It is difficult to always write big posts. How to write big post? If you are also one of those people who want to write a big post but if you can not write anything more than 500 words, then you can read this paragraph whole. Writing a big post does not mean that you should use a lot of words in your post and write your post in more than 1000 words. By writing a big post I mean in a post that explains the topic selected in that post. Suppose I am writing a post that seo is done. So now I will not add extra stuff to that post. The type of Seo is the type and its type is also to be explained. So now when I share the complete information related to the seo, it will increase my post too and my seo will also happen and the reader will read my post, even if the boo is written about seo . All the search engines will also follow and the post will also rank well. # 1. If you want to get top rank then you have to follow some rules of search engine. One of those rules is that the post should be large. Yes, if you write a big post, then you can easily get top rank. #2. When you type big post, many keywords rank in it so that your traffic increases. # 3 When you write a big post, your writing skill becomes very good, so that you can write better on your next post. # 4. Writing a large post makes ranking very good in your post's search engine. 2. Write for your visitors. When I started blogging, I did not write for my visitors, I used to write only to earn money but I later came to know that I will not be able to make money until I write for my visitors. By reading the example above, you have come to understand that I want to tell you. So always write any post just for your visitors, so that whatever comes once a visitor to your blog comes repeatedly. 3. Write the treding post. Writing a trading post means writing a post on what is going on in the trand. Find out how Google is doing in the trand. So today I gave you this complete information about "how to rank top without a post of seo. " But let me tell you one thing that "Seo" is very important for the blog, yes and it is very difficult to bring traffic without seo. But I have told you about the ways. You follow them all completely. These will definitely take your post top rank. But this will only give you the top rank of 5-6 posts so if you are a blogger then learn seo definitely because seo is very important in the life of a blogger. Learning Seo is not a big deal. Read some posts below. You will know "seo" very well.